Luscious lemon – and some beautiful broccoli. 29 November 2015. After all that baking yesterday I really thought I’d be wiped out today. Instead I was awake at 7.00! I find it so hard to get up during the week – it’s a mystery how easy it is to be up and about at the weekend. Anyway. I got up and pored over various websites for sweet treats for Christmas. I have taken down a recipe for coconut macaroons which I may try later but I’m mid corrections at the moment so they need to be done before I do any more domestic stuff! I made a gorgeous little lemon pot – definitely not too sweet but I loved it – Paddy had it with cooked raspberries for breakfast topped with hazelnuts – I’d do almonds the next time – or pistachios if you’re not being as rigid about carbs as we are – they have 28 gms of carb per 100 – very high for a nut. I might either experiment with a few variations on a crumble type crumb – Australian Masterchef is a great place for inspiration! Today was the starting place! Simple. 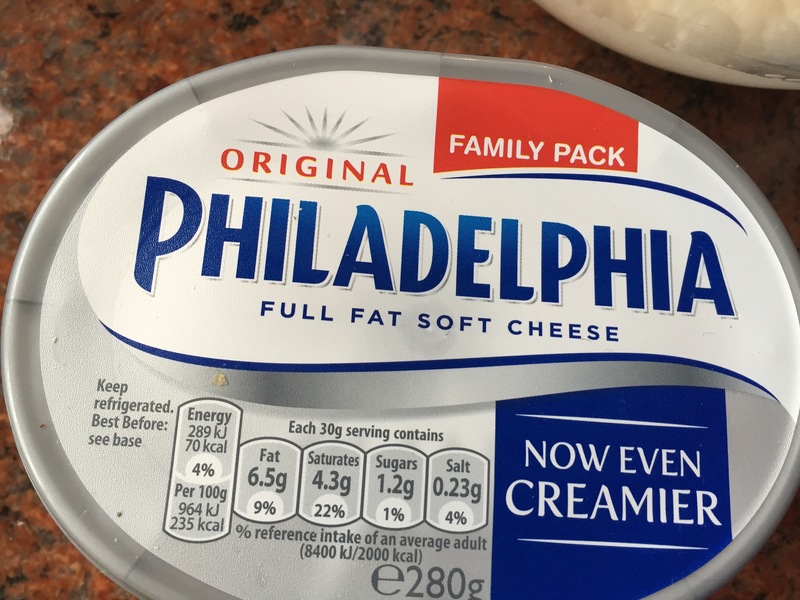 I mixed some Philadelphia with fresh cream then added in one dessert spoon of xylitol and about a tablespoon of lemon juice. Whipped it up. Yummy! So tasty and creamy. 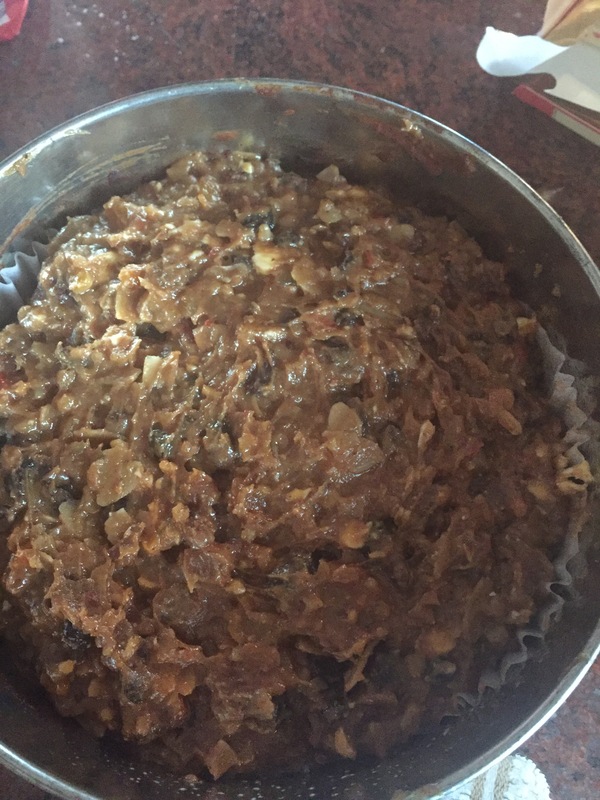 It tasted delicious – I have a family gathering at the weekend – maybe a variation will grace the table…. 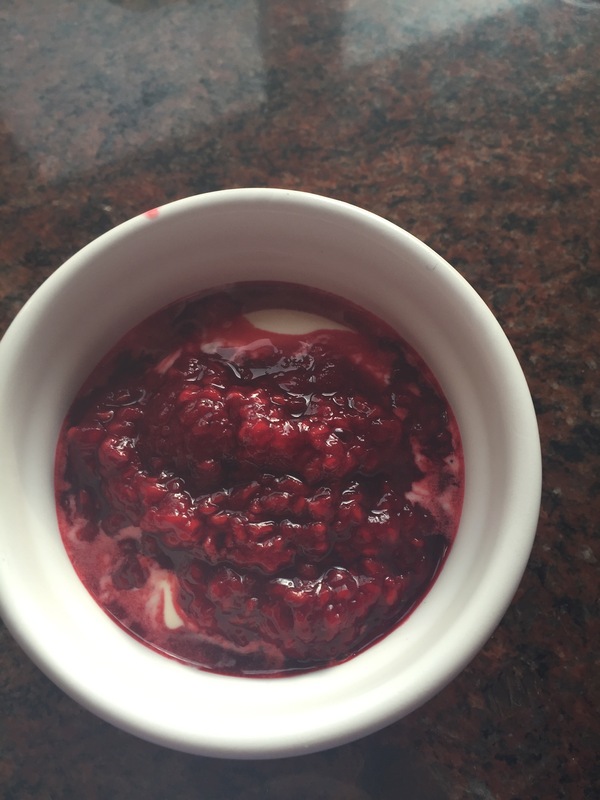 The other recipe I have to share is a made up one – pure delight. 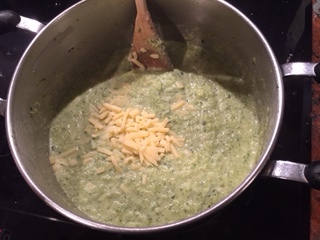 I had about 700gms of broccoli in the fridge fast approaching bin state – I decided to make another broccoli soup – without the cheddar this time. 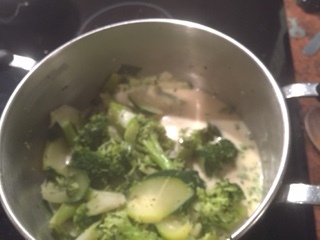 I added the broccoli to a pot with one veg stock cube and a little water- maybe about a pint. 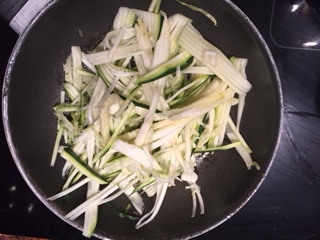 I also added two courgettes – they are such good value at the moment – 49 cents in Aldi – Banting doesn’t have to break the bank! 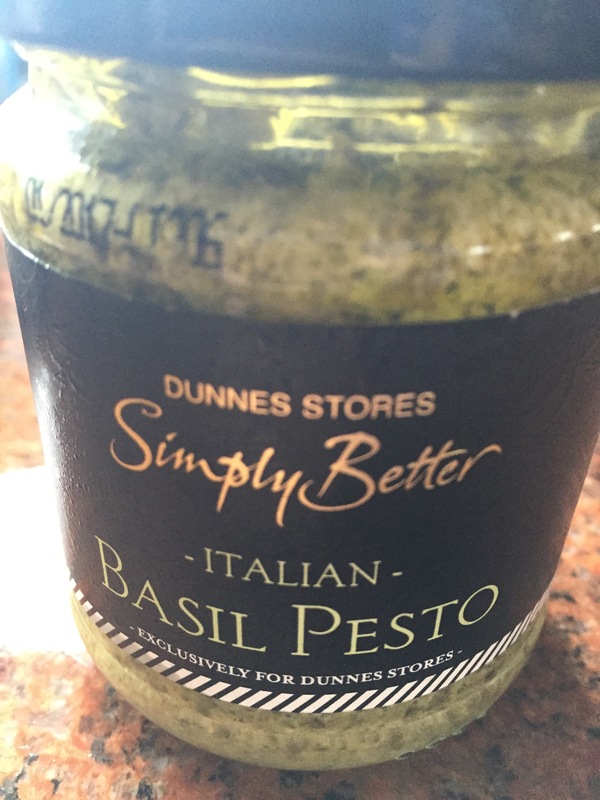 When the veg were soft I switched off the heat and added 250 mls of cream and a dessert spoon of Dunnes Stores Simply Better Italian pesto. It’s Banting friendly! It was gorgeous – so much so I’m planning on serving it for starter next Saturday night – family members be warned! We had it with some Parmesan shavings and a bit of black pepper. I just saw a very interesting chocolate dessert on Come Dine With Me – I’ll definitely be adding it to my list of dishes next weekend. You can feed everyone Banting friendly food and not deprive them. Christmas is coming. Let’s make sure only the geese get fat. 28 November 2015. I mentioned before now that in my former life I was an avid baker. I love baking. 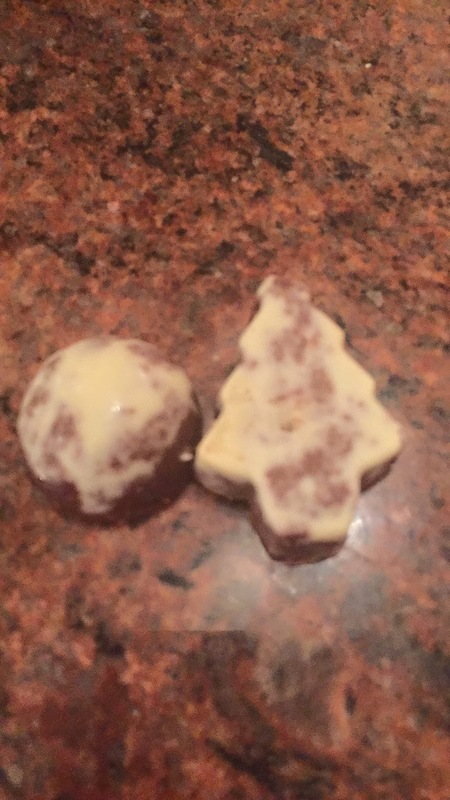 I also love Christmas. With thirty pounds off I don’t intend to become a sugar eater anytime soon again. However this weekend I indulged in some baking, none of which is suitable for me at Christmas. It’s frightening to actually see how much sugar there is in a Christmas cake. In a ten inch round today my daughter and her buddy put in 350 gms of dark brown sugar. I suppose that’s not too much really for the number of slices you’d get from that cake. Until you consider that there is also 1450 gms of dried fruits in there too. Suddenly there’s a whole lot more going on than you first thought. I can honestly say I wasn’t at all perturbed by all the baking – we had our best friends over so we had quite an industry going on – chocolate biscuit mini puddings and mini Christmas trees, and some chocolate brownies as well as my signature bake – raspberry and white chocolate muffins – there’s a cake sale at work next week for charity. I was happy to create and not indulge – honestly. I also think that it is important not to impose our habits on everyone else unless they choose. It has set me thinking about the logistics of the holiday season however. It is a season of eating – and so much of it is off limits for Paddy and me. I have started to investigate alternatives that we could enjoy without feeling like we were missing out. None will contain carbs but I think I will seek out some desserts using xylitol. Apparently my sweet tooth is not quite as sweet as I think – the lemon cake I thought was deliciously sweet was apparently quite tart indeed! I will make and post about some savoury nibbles in the next few weeks – if you would like me to try to create alternatives for best loved Christmas recipes comment and I’ll do a search to see what I can come up with! I have a few ideas for stuffed mushrooms and peppers – and maybe even courgettes too – I’m loving that vegetable at present! I’ll experiment and let you know how it goes. I love fish and have a few simple recipes using smoked salmon and crab – thanks to my sister in law. There is also a most wonderful little smoked haddock dish thatvi made twice before. I’ve lost the recipe but will definitely find it – such a gorgeous little mouthful it is! I’ve only made two types of crackers up to now but I’ll try out a few more – they’d work well with the salmon paté and the crab dish. It’s actually very simple to cone up with savoury dishes. The sweet ones are a bit harder. Maybe that’s because sugar is really not Banting friendly. It’s hard to believe that I’m okay with that. Not so sure about my husband! I’d better get searching for some Banting desserts! Dessert in our house today. 22 November 2015. Hi everyone. Apologies that it’s been 11 days since my last post. Life moves quickly on and people think I’ve given up on the banting – a favourite past-time has been to try things for a while and then give up. Not this one! My mother tentatively suggested that when the weight is not moving in a downward trajectory to stick with it. That has been the case for the last three weeks – until yesterday. I broke the two stone barrier and then had another pound off this morning – such a great feeling – I have 29 pounds off and I have brought my BMI down to a 38 – huge for so many of you but such a result for me. My husband went to the doctor and got his blood pressure tablets reduced by more than half. He also got a reading on his cholesterol – 3.6! Even the sceptics are sitting up now and taking note! The beauty of this plan is I am not on a diet – I am just choosing to eat in a certain way – I can have a glass of wine if I choose, I can have a piece of chocolate if I want, but most of all – for the first time ever I can truly say that I have lost the gaping, yawning hole inside of me that food never filled before. Psychologists tell you that you are emotional eating – I have come to the conclusion that I was addict eating actually – because life has not suddenly become utopian – the same rows and the same struggles happen every day – but I don’t have the same yearning gnawing at me to feed the beast – the sugar addict! 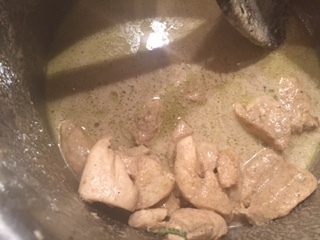 Two updates on the previous post – that Thai curry sauce is available from Dunnes Stores – and at a cookery demonstration the other night I learned that if your coconut milk separates then add a little chilled butter and it will bring it back together! 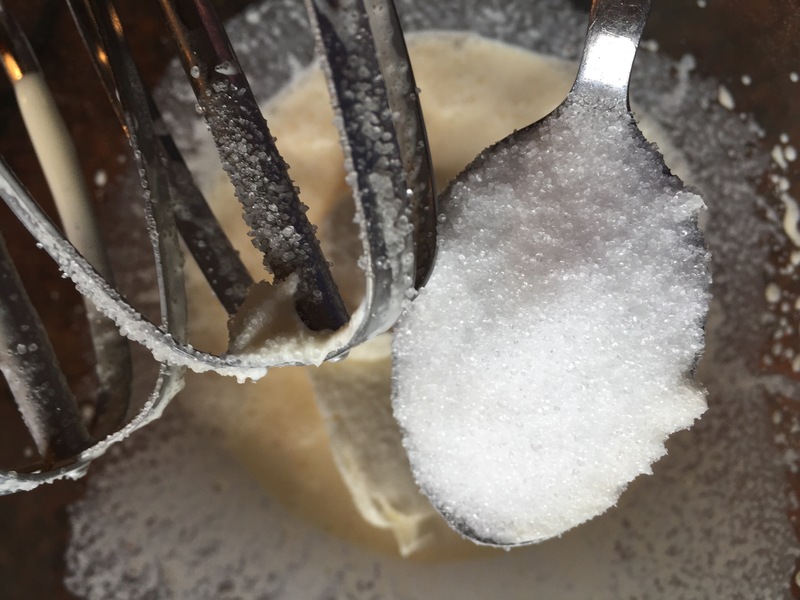 Okay – today’s recipe comes from a site called Iquitsugar.com – there are so many sites out there that have all sorts of recipes for you to try out. I’m going to my parents’ in – oops ten minutes so I made this cake as an alternative to Mammy’s tart! Let’s see how it tastes – I’ll let you know tomorrow. 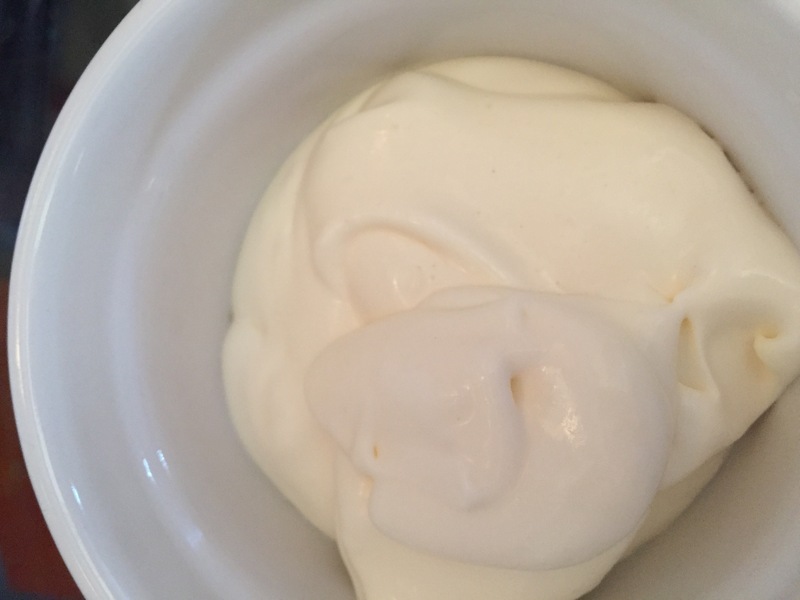 1/2 cup milk – I used cream! 1 cup almond flour- I used 3/4 and 1/2 coconut as I ran out of almond. 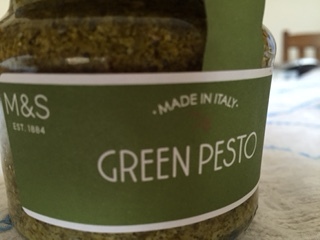 1/3 cup Extra virgin olive oil – did you hear the scandal about that during the week – lots of reputable companies diluting with cheaper olive oil! 1 tblsp cocnut cream – make sure not to take any of the watery stuff – just the solid cream. xylitol to taste – max 1 tblsp! 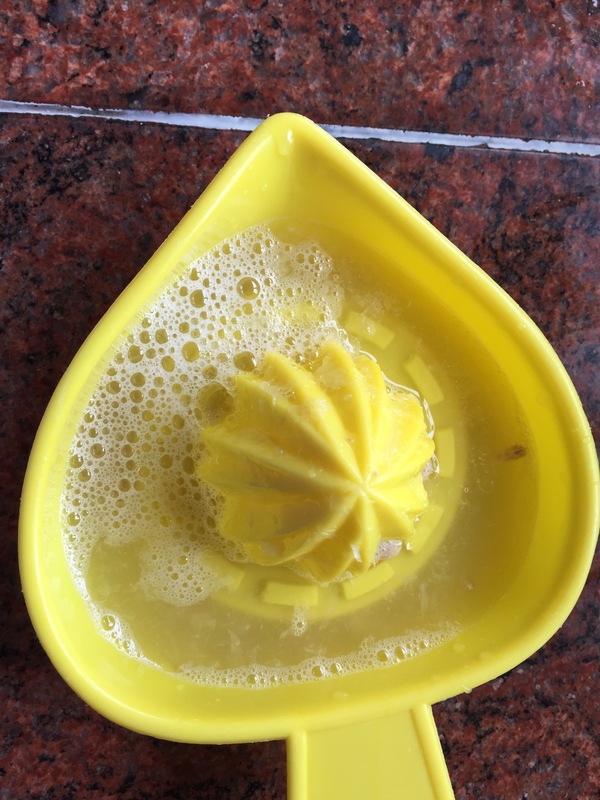 Throw all the wet ingredients into a bowl together – except for the egg whites – they need to be whisked to a stiff peak separately. Then add the dry to the wet – I did it the other way around – will try the correct way the next time! When all is mixed well fold in the egg whites and place all in a cake tin – mine was a ten inch – Id say an eight inch would be better but I didn’t have one here so I made do. Cook this for about 25 minutes. It came out flattish but smelling great – I’d suggest leaving in the tin as it’s very delicate – mine cracked slightly after moving it – not to worry – there’s a lovely sauce to go over it! 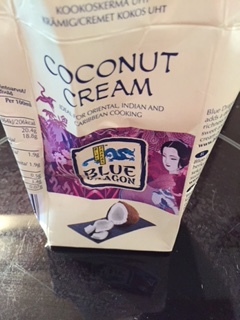 Heat the coconut cream in a pan and add the lemon juice and xylitol. Pour over the cake and serve. I have no photo yet as I will do that at home in Newbridge! 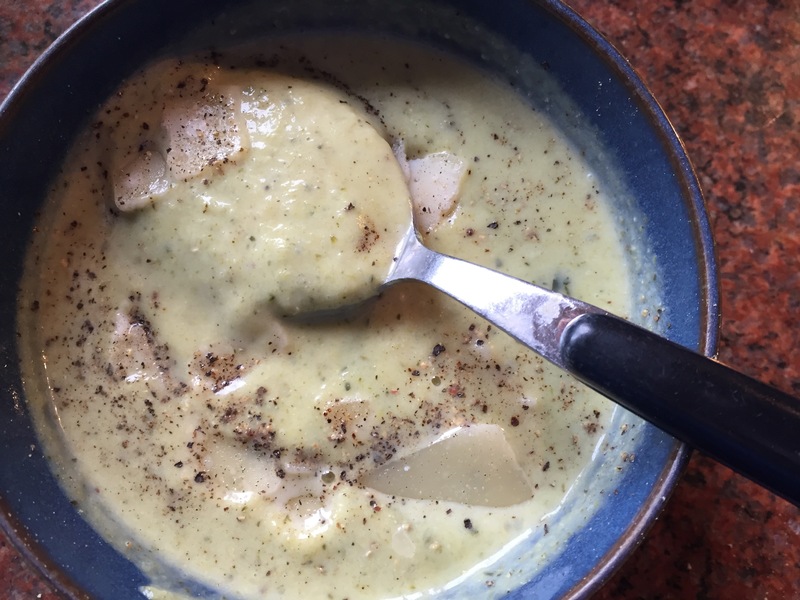 I’ll post how it was received tomorrow – along with my husband’s meat soup recipe – he swears by it for filling him and helping the pounds to move! Keep that sugar at bay! Some like it hot! Curry etc…. 11 November 2015. Apologies for not posting sooner – I kept planning to post and then life got in the way – we had a lovely family weekend and so I just didn’t bother with posting up the recent recipes I tried – but I’m back and I have a few lovelies for you all tonight! My first task was to make a curry for Paddy. We love one pot meals and there is nothing nicer after a busy day to come home to something that is ready to pop into the microwave. 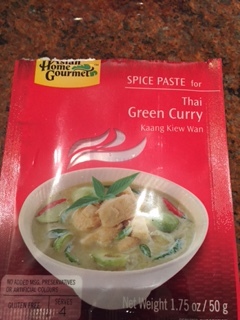 So I searched high and low and finally found a suitable packet paste for Thai Green Curry. 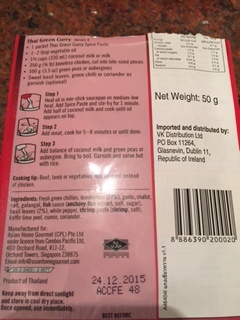 It is from a range called Asian Home Gourmet and they are difficult enough to find – I got mine in Nolan’s Butchers in Kilcullen – they of Craft Butchers of Ireland fame – they won first place this year. I have sent an email to the company asking where the sauces can be bought and I’ll keep you posted. 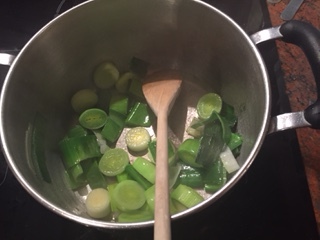 I heated a saucepan with a little coconut oil in, then squeezed in the paste – I know you should make your own but you know – Tuesday evening – busy lives – I don’t usually have lemongrass and the like on hand! Have a look and you will see – nothing bad in the paste – a tiny amount of sugar in the fish sauce – negligible, so it was okay for us. Into the paste and veg I threw in about a carton of coconut cream – I had no coconut milk – it didn’t matter – it worked very well. 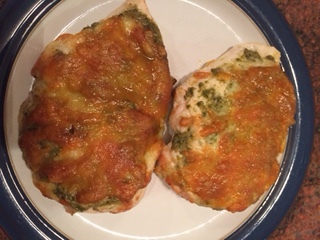 Then I added my chopped up chicken breasts – I used three small ones for dinner for two. the sauce wouldn’t really stretch to more than that. I watched that it didn’t boil as coconut has an awful habit of separating if it boils vigorously. I left it on the hob at a very low heat – about 3 on mine – for 30 minutes – long enough for the chicken to cook and be tender. 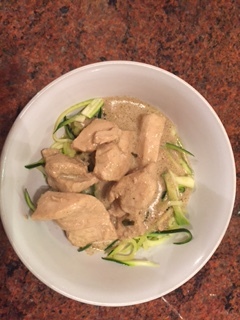 Then I julienned my courgette and cooked it in a tablespoon of coconut oil and served the curry on top of that. Oh my word – what a tasty dish – I will have to visit my mother again soon just so I can get a few sachets of that sauce – it was really gorgeous and so satisfying. So many people wonder how we can follow this plan with no carbs – everyone says – Oh I couldn’t live without my bread/pasta/potato/rice/noodles. Hello! Meet your sister! Yet here I am 12 weeks later expounding the virtues of courgettini as the noodles of courgette are called affectionately by the banting community! Really. I’m not pretending to like them – they are truly fabulous – and we do not miss the carbs! 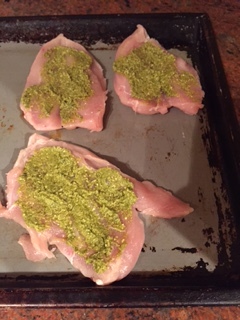 Of course while that was cooking I had some chicken breasts left over so I decided to make up my own recipe – so I butterflied the breasts then threw some pesto – I found a suitable one with all the right ingredients in M&S – where would I be without them! Then I loaded them up with my mature grated cheddar from Lidl or Aldi – it’s all a blur – and whacked them into the oven at my favourite temperature of all – 180 degrees fan! They cooked merrily for 25 minutes and were amazing. I had half a breast for lunch the next day with avocado, tomato and leaves – oh and a dollop of Philadelphia – – my workmates were intrigued – and it tasted great and was so filling. This week I pooched in the fridge and sighed. My husband had an incident with some spinach which had gone off we think – his tummy was a bit wobbly for 36 hours – a great result on the scales mind you – he’s now down over 2 stone – I’m still hanging in at 25 pounds – it is the same with every food plan – men just lose more quickly than we do – and I realised that I had a 500 gm head of broccoli ready to throw away. 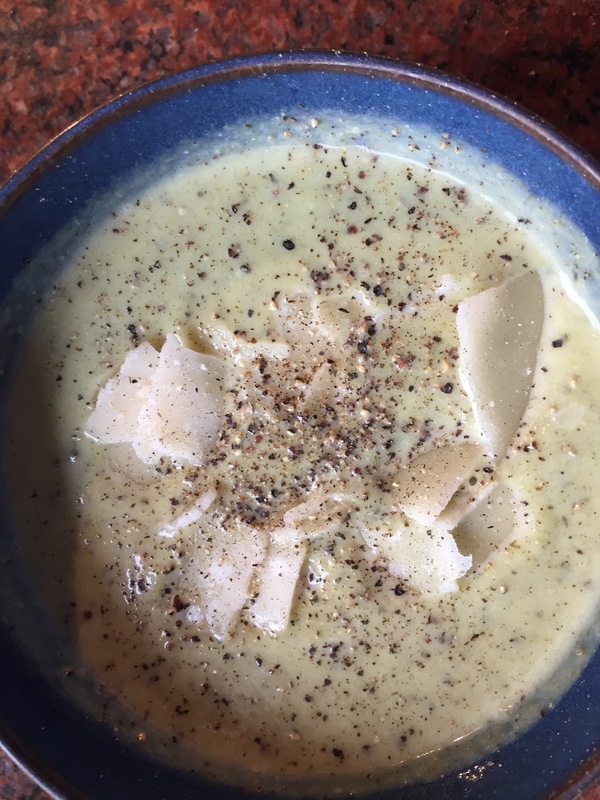 Instead I made broccoli and cheddar soup – with some other stuff I found! I sliced a leek and fried it in a saucepan with a tblsp of Extra Virgin Olive Oil. 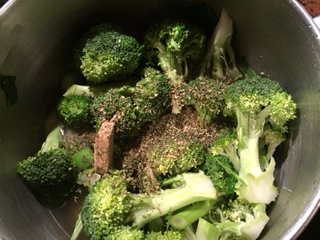 Then I chopped the broccoli into pieces and threw it in on top. I did let the leek brown a bit for flavour first. Then I added about a pint of water and a vegetable stock cube. I will be honest and say I don’t stress over brand of stock cube – there is always a bit of potato starch in them but my God that’s okay with me – I am a banter but not an evangelist! I then discovered a courgette that was ready to head for the compost heap any day soon too so I chopped that up as well and threw it in. Oh and I put in some dried mixed herbs. It was so easy. I let it cook until the broccoli and courgette were soft – about fifteen minutes. I then took it off the heat, poured in 100 mls of cream and blitzed it with the stick blender. when that was done I put it back on the hob and added 150 gms of mature grated cheddar and let it heat to eating temperature. That amount made five portions. It was just gorgeous. I added flaked almonds on top the first time I ate it then didn’t bother after that – it was so tasty and I have had it twice at work for lunch this week – really hearty and very satisfying. It has been an interesting ten days food wise. I am realising that there is so much food out there that is low carb and tasty – and sugar free. 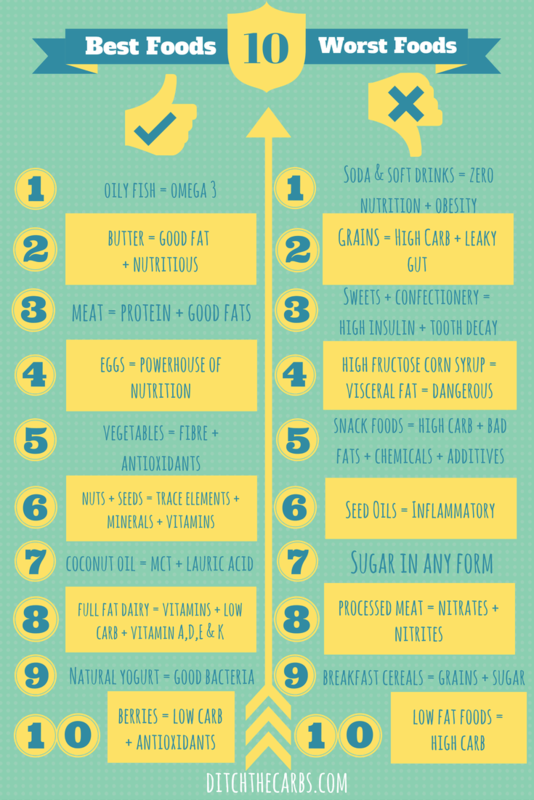 I found a great site called ditchthecarbs.com and have taken a page from their site about the best and the worst foods to eat. It pretty much sums up what we are doing here. They also have some delicious recipes for you to try out.